Wine.com is the #1 Online Wine Store, with the largest selection of wines available for purchase in the US at prices to fit every budget. Browse, search, or scan a label to view professional ratings, reviews, and pricing. Find your favorites, or let our friendly, non-commissioned sommeliers help you choose. Delivery is fast and convenient. Most orders arrive in 1-2 business days -- or set an arrival date up to six months out. 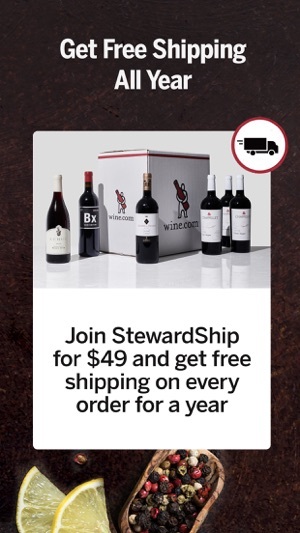 With the Wine.com StewardShip program, enjoy free shipping on every order all year for just $49. My Wine keeps all your favorites in one place. 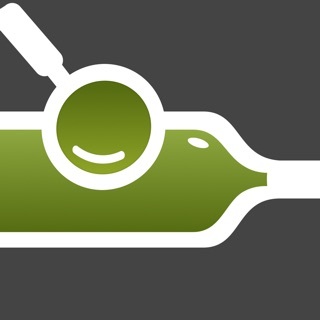 From here you can easily rate bottles and re-order wines as you try them. 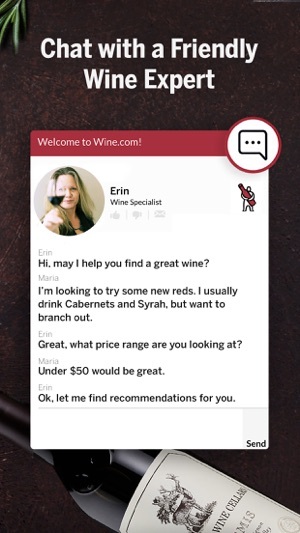 The more wines you rate, the more personalized recommendations you’ll see as you shop. 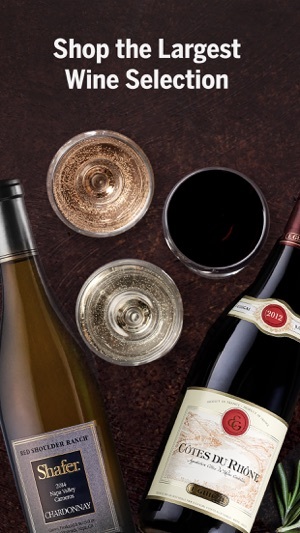 Get a better look at the wine you’re shopping. Now you’ll find labels *and* bottle shots on product pages. 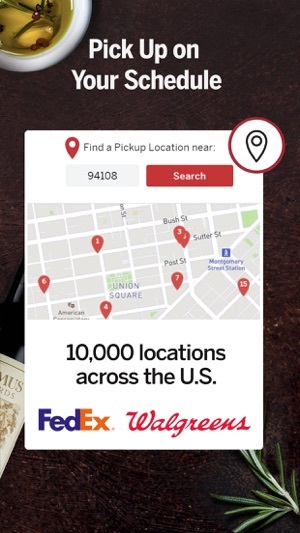 Try Local Pickup: Use our new interactive map to spot one of 10,000 locations nationwide that’s convenient for you. You don’t need to worry about being home to sign, and most locations have extended evening and weekend hours. Keep track of all your favorites in the improved My Wine. Everything you buy, rate or scan is automatically saved here to make browsing and reordering easy. And you can now add items directly to your list as well. Check the progress of your orders with our updated order history page. 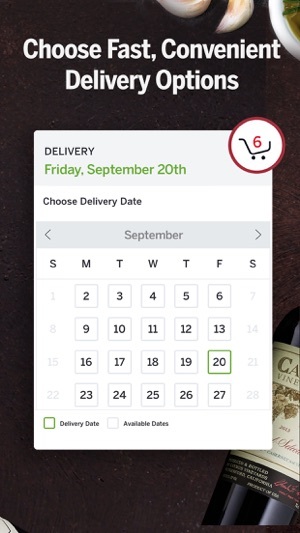 This app runs pretty smoothly and has some good filters for selecting wines to buy. However I can’t find a way to easily come back to the wines I’ve enjoyed and would like to buy again- I have to pick through a list of my old orders, click on each wine by name, and read my review of it. There is no favorites list, no cellar tracker, and even the orders lists don’t have the label pictures for reference. If it had these things I think it would be a great app. Thank you for installing the app and sending us feedback--it is much appreciated! 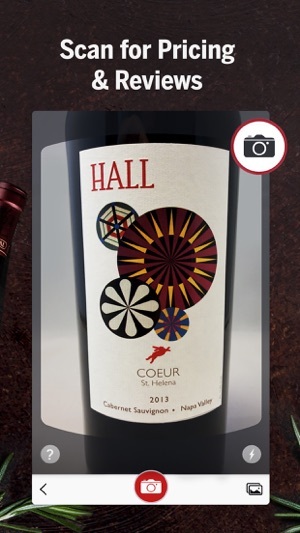 When it comes to keeping track of your favorites, be sure to check out the My Wine feature. You can get to that by clicking on the icon of the bottle with a star on it in the header. 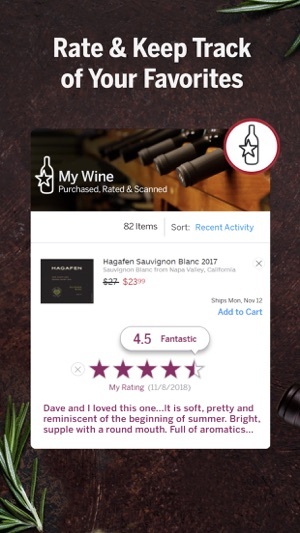 My Wine will automatically keep track of everything that you purchase, rate or scan, and you can now add items directly to this list from any product page. We'd love to hear what you think about that feature and are all ears if you have any suggestions about what would make it more helpful--just drop us a line at app@wine.com if you have any additional thoughts. Such a slow program where individual pages actually load like you’re on a 2400 baud modem with a red line at top indicating progress if the pages. Additionally, oh though I have ordered many times it continues to set my default state upon launch as California and not Florida so when I put wines in my card and go to check out it says, “Oh sorry you can’t order these because you live in Florida not California.” Ridiculous. How can an app not know where I’m located; especially when I’m logged into my profile, only shop to Florida and use it frequently. Get with it & hire a reputable app developer. Thanks for your feedback. We realize the ship to state is a bug and will fix it ASAP. We are always working to improve the app experience so check back soon!